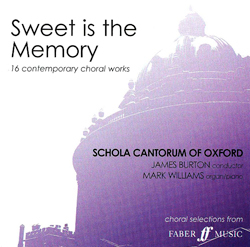 Taken from Faber Music’s new choral sampler CD, Sweet is the Memory (2009). Tracks on this CD are published in Faber’s Choral Signature Series, which presents new or recently composed choral music to choirs in search of fresh, contemporary repertoire. 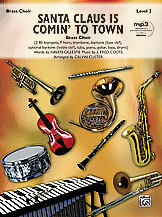 This series contains both lighter and more serious works, and features both established contemporary composers and some of the brightest young composers working today. Please contact us for more information on this particular piece: choral.us@fabermusic.com or 818 891 5999 (ext. 237). Performing choir: Schola Cantorum of Oxford, England. Conductor: James Burton. Organ / piano: Mark Williams. Este producto esta en nuestro catálogo desde miércoles 23 septiembre, 2009.